Instrument cluster. Fault in airbag and belt tensioner system. Go to a qualified workshop to have the system checked immediately. Dash panel A. Fault in the airbag system. Go to a qualified workshop to have the system checked immediately. Front passenger front airbag switched off. 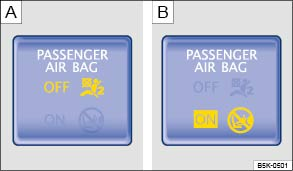 Check whether the airbag should stay switched off. Dash panel B. Front passenger front airbag switched on. No solution – the indicator lamp will disappear automatically approximately 60 seconds after the ignition is switched on, or after the front passenger front airbag is switched on using the key-operated switch. If the indicator lamp PASSENGER AIR BAG is not continuously lit or if it lights up together with the indicator lamp in the instrument cluster when the front passenger front airbag is switched off, there may be a fault in the airbag system . If there is a fault in the airbag system, the airbag may not trigger correctly, may not trigger at all or may trigger unexpectedly. This can cause severe or fatal injuries. The airbag system should be checked by a qualified workshop as soon as possible. Never fit a child seat to the front passenger seat or remove a child seat that is already fitted. The front passenger front airbag may trigger during an accident in spite of the fault.